This spectacular film is a comprehensive look at the history of surfing, from its origins as a tiny subculture to its widespread resurgence – and surfers’ ongoing obsession with the sport. 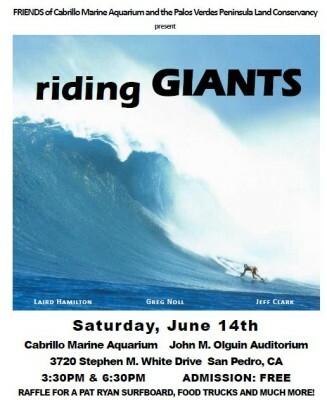 Stacy Peralta directs this critically lauded opener to the 2004 Sundance Film Festival.CMA is turning the film screenings into a surfing celebration! Wear Hawaiian shirts, check out vintage a vintage woody wagon and surfboards and enjoy good eats from the “Meat in the Middle” food truck. (Ten percent of food sales will be donated to FRIENDS of CMA.) Buy raffle tickets and have the chance to win a surfboard from Pat Ryan Surfboards!Winner need not be present to win. For more information and to purchase raffle tickets online please visit https://cabrilloaq.ejoinme.org/?tabid=541580. This is a FREE event; please RSVP online at http://pvplc.org/_activities/RSVPRidingGiants.asp. There will be two screenings: one at 3:30pm and a second at 6:30pm.This screening is the second of five films in the Beauty of Nature Film Series hosted by he Palos Verdes Peninsula Land Conservancy. Come for the movie and stay for the CMA grunion run starting at 9pm. For more information visit www.cabrillomarineaquarium.org.